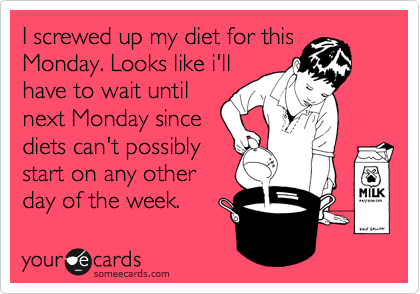 Monday is the day that I have been going to start a new eating plan for years. After all, who wants to start on the weekend? Then, when Monday comes I can’t bring myself to commit, so I decided that I am going to start the next Monday. It wasn’t until I heard this sentence come out of someone’s mouth that I realized how totally absurd it is. Even though I know how absurd it is, I still can’t bring myself to start until Monday. I guess it is the same idea as starting a health routine on January 1st. It just feels right to start a new adventure on the first day of the week or the first day of the year. The best day to start is now! But still, I think I will start on Monday. Watch out Monday. Here I come.